When there's no more room in hell, the dead will walk the earth... and then they'll sleep in comfort, thanks to these adorable pajamas from The Walking Dead! 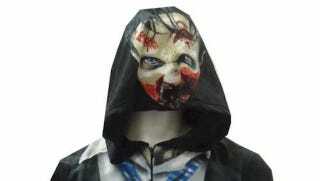 They're adult-sized, cover the feet completely, and come with a hood you can pul down for that complete zombie look. They're also a mere $38 over at Amazon, which is a pretty good deal for any footie pajamas, let alone ones that make you look like a rotting corpse.